High tunnels are a popular tool used to extend the growing season, particularly for organic vegetable, flower, and fruit growers (Pool and Stone, 2014, 2015). Their popularity is no surprise given increased yield and quality for many kinds of produce, in addition to a price premium for fresh, local products outside of the typical growing season. Construction expenses for high tunnels can be prohibitive for some growers, but beginning in 2009, the USDA-Natural Resources Conservation Service (USDA-NRCS) has funded a cost-share initiative for high-tunnel construction through the Environmental Quality Incentive Program (EQIP) that has resulted in over 10,000 new high tunnels since the start of the program (USDA-NRCS, 2018). A growing number of farmers have begun to notice certain production problems unique to high tunnels; namely, an increase in some soilborne diseases, foliar diseases associated with greenhouse production, and an overall decrease in soil health (Fig. 1). The combination of these issues can decrease plant productivity over time. 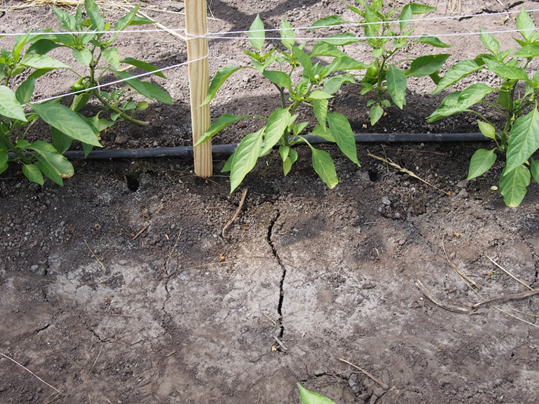 The soil health issues in particular include a loss of organic matter (which leads to degraded soil structure) and an increase in soil salinity from irrigation under dry conditions (eXtension Foundation, 2013; Magdoff and VanEs, 2009). Another challenging aspect is the increased growth rate of weeds due to increased heat in high tunnels (Blomgren et al., 2007). 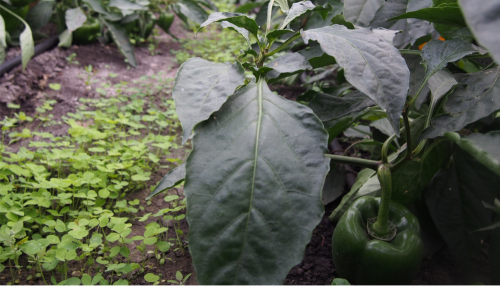 Intensive cropping cycles also require frequent fertilizer inputs, which for organic growers consist of compost, manures, or other animal byproducts. These organic inputs often provide phosphorus that exceeds plant nutritional needs (eXtension Foundation, 2016). Many of these problems could be addressed by including cover crops in high-tunnel crop rotations. Cover crops are known to increase organic matter, disrupt disease cycles, and, in the case of legumes, add nitrogen through symbiosis with rhizobia bacteria without increasing salinity or phosphorus to the same degree as manure, compost, or fertilizers (Treadwell, 2009; Zieminski, 2018; Monfort et al., 2007; Zhou and Everts, 2007). Research exploring cover crops in high-tunnel crop rotations is relatively new, but initial findings are encouraging. The primary challenge for farmers who want to grow cover crops in their high tunnels is how to balance the time required to grow a cash crop and a cover crop. In this article, we will discuss management basics, benefits and challenges, and seasonal options for including cover crops in high-tunnel rotations in the northern United States, drawing on the combined farming and research experience of the authors in the Northeast, Midwest, and Pacific Northwest. Figure 1. High-tunnel soil showing poor soil quality with compaction and surface cracking. Photo credit: Elizabeth Perkus, University of Minnesota. The basic operations of growing a cover crop in the high tunnel are similar to growing a cover crop in the open field: planting, growth, and termination—though some specifics are slightly different. Growers can plant larger areas by broadcasting and raking seeds in to ensure good seed-soil contact, or between rows using a walk-behind direct seeder for more uniform stands (Fig. 2). Following planting, irrigation must be supplied, as the plastic cover on the high tunnel excludes rain. Irrigating cover crops is best done with an overhead source because drip tape needs to be removed before termination. However, if high temperatures make overhead irrigation impractical or the tunnel is constructed with water-sensitive materials, such as untreated wood, the task of removing drip irrigation before termination may be worthwhile. Figure 2. Walk-behind six-row direct seeder. Photo credit: Emily Swanson, University of Minnesota. Termination is a more intensive task and can be difficult in a high tunnel, especially with high biomass cover crops which may be very large by the termination date (Fig. 3). As with any cover crop, it is important to monitor each species and terminate all the cover crops before the initiation of seed set. This will provide the greatest nitrogen contribution, as nitrogen will still be stored in vegetative tissue instead of sequestered in seeds. This will also prevent cover crops from self-seeding and becoming weeds in the tunnel later. The most common method for cover crop termination in high tunnels is mowing, then tilling to incorporate biomass after a few days of drying the plant material on the soil surface. The drying period after mowing makes the cover crops easier to till into the soil. If field-scale mowing and tillage equipment is too large for the high tunnel, it is important to find a balance of machinery that will both fit into the tunnel and completely terminate the cover crops. Walk-behind flail mowers and small riding mowers work well, but smaller equipment, like a regular push lawn mower, will only work on low-biomass cover crops. Another option is to use a weed whacker to terminate taller-growing cover crops, then use the cut biomass as a surface mulch or chop the material more finely with a push lawn mower prior to incorporation. Many cover crops require tillage for complete termination, especially if they are mowed before flowering. Figure 3. Overwintered cover crops in high tunnel. Photo credit: Elizabeth Perkus, University of Minnesota. Once the cover crops have been fully incorporated, it is best to wait about 5–14 days to plant the following cash crop. During this time the fresh biomass in the soil will begin to break down, increasing soil moisture and the community of decomposers. In the first days of decomposition, nutrients may be less available for crops. Also in this environment, newly planted seedlings or germinating seeds can be subject to rot or predation (Dufour et al., 2013). Fall-planted cover crops that are intended to winter-kill may be a great option after an early or main-season summer crop. These winter-kill species are chosen to put on a quick flush of biomass in the fall and then die back in late fall or winter with the arrival of freezing temperatures. In climates without prolonged freezing temperatures, a winter-kill rotation may not be possible. Winter-killed cover crops require no mowing equipment after establishment, so they work well for growers who operate with less mechanization. They are also ideal to precede an early spring crop since the winter-killed residue will provide some amount of soil cover but not require active spring termination, leaving the soil ready for early spring planting. Growers who choose to incorporate remaining residue in the spring will need to use some tillage, which could be manual or mechanized. To maximize the soil health and early-spring planting benefits of a winter-killed cover crop, it is important to choose a species with low spring residue that will not require extensive tillage nor tie up nutrients in decomposing plant material (Dupont et al., 2018). Winter-killed cover crops can provide several benefits including fall weed control, organic matter contributions, and soil compaction mitigation (Johnson, 2016). Species selection for winter-kill cover crops is region-specific, since timing and severity of cold temperatures will vary widely by growing zone. The high tunnel buffers cold temperatures, allowing some species to survive in the tunnel where they would not survive open field conditions. In these situations, winter-kill could be achieved by opening sidewalls to lower temperature, and minimizing irrigation inputs to force senescence. Depending on timing, drought may induce cover crops to set seed quickly, so this technique should only be used before flowering. Species selection for winter-kill cover crops will depend first on grower goals, which are typically organic matter input, weed control, pest control, or nitrogen fixation. Tillage radish (Raphanus sativus) is an excellent winter-kill cover crop choice based on its ability to reduce soil compaction, scavenge fall soil nutrients, and leave very little spring residue. However, tillage radish has been observed to survive winters in high tunnels in zones 4b and warmer, so growers in many regions will need to monitor this species closely. Buckwheat (Fagopyrum esculentum) is also a quick-growing, frost-sensitive crop that is effective at weed control and improving soil aggregation. Oats (Avena sativaa) are a common winter-kill grass species in cold climates, and when paired with a frost-sensitive legume like cowpea (Vigna unguiculata), they can form a mix that provides nitrogen fixation, organic matter, and weed control. Overwintered cover crops fit well into rotations with a winter fallow period. They are seeded in the fall, survive the winter, grow rapidly in the spring, and are terminated and incorporated in spring just before the cash crop is planted. Ideally, the cover crop should be flowering at termination. Overwintered cover crops fit best prior to a warm-season cash crop planted in the mid to late spring, such as tomatoes or peppers. Overwintered cover crops can improve soil quality and cash-crop productivity, and can increase soil microbial activity (Rudisill et al., 2015). A study in Arkansas found that high-tunnel tomato yield increased in plots following an overwintering legume cover crop compared to control plots with no cover crop (Freeman, 2016). Timing of fall sowing and species selection for overwintered cover crops depends on the summer use of the tunnel. If tunnels are used to extend the summer growing season, growers may wish to plant cover crops fairly late in the fall. The increased daytime temperature and buffered nighttime lows in a tunnel allow later planting of fall cover crops than would be feasible in the open field. However, in cold climates, it is ideal to plant the cover crops as early as possible in the fall so they are able to establish some robust growth before temperatures become limiting. One way to have both season extension and longer cover crop growth is to interseed an overwintering cover crop into the existing summer crop (Fig. 4). The summer crop can be removed when its production is finished and the cover crop can continue to grow throughout the winter. Figure 4. Vetch/rye/radish mix seeded between yellow bell peppers. Photo credit: Elizabeth Perkus, University of Minnesota. Overwintering cover crops in cold climates require special attention to moisture and temperature management. Maintaining adequate soil moisture can be a challenge during winter in high tunnels since most tunnels are not equipped with a non-freezing water source for winter irrigation. For this reason, regions with cold, dry winter weather may see rapid desiccation of unfrozen soil. To address this, cover crops should be thoroughly watered right before the water supply is shut off for winter. At this point the sides of the tunnel should be rolled down and secured, and the doors closed. These steps can help prevent water loss from evaporation and wind, though this may not be necessary in regions with warmer, more humid winters. Dramatic winter temperature fluctuations in the tunnel create a unique temperature environment for plants. Sunny days can raise the temperature in the tunnel much higher than outside temperatures. However, due to the minimal insulation of high tunnel plastic, nighttime lows in the tunnel will be similar to outside. Unlike plants in the open field in northern regions, high tunnel cover crops do not have an insulating blanket of snow. Using row cover within the high tunnel is a management technique to combat both moisture loss and temperature extremes (Fig. 5). This insulating layer holds heat in the soil, helps retain soil moisture, and mitigates air temperature fluctuations. Figure 5. Row cover supported by low tunnel hoops over cover crops in the high tunnel. Photo credit, Charlotte Thurston, University of Minnesota. Since overwintering cover crops in the high tunnel will experience low temperatures similar to crops in the open field, varieties should be selected for winter hardiness. Legumes such as hairy vetch (Vicia villosa) and red clover (Trifolium pratens) and grasses like winter rye (Secale cereale) are suitable for overwintering in high tunnels across the United States. Subterranean (Trifolium subterraneum) and Crimson clover (Trifolium incarnatum) will more reliably overwinter in USDA Hardiness Zones 6 and above (Young-Mathews, 2013.). In the spring, overwintering cover crops will grow quickly in response to higher temperatures and increasing light. If row cover is used, it can be removed as soon as night temperatures are reliably above freezing. Due to this accelerated spring growth, cover crops may be ready to terminate by March–April, depending on the region. Some cover crop species may harbor cash-crop pathogens, such as the Erysiphe genus of powdery mildew that can infect both clovers and cucurbits, so growers should consider this when choosing cover crop species (Mahr, 2016). Spring-planted cover crops could fit well into a high-tunnel rotation for growers who have a late fall crop and plan to start their summer crops in late spring. Cold-tolerant species, such as hairy vetch, red clover, field pea (Pisum sativum), winter rye, and oats, can be planted as soon as the soil can be worked and will withstand early spring frost without supplemental heat. A spring cover crop will not grow to full size or maturity before termination time. This younger plant material has more nitrogen and less carbon, so it will break down quickly in the soil. The cover crop will be approximately 1/3—1/2 the size of overwintered cover crops, but can still provide soil health benefits . Legumes can supply some nitrogen, and grasses or broadleaf species can shade out weeds. A study in Minnesota found that spring-planted red clover provided 23.7—30.8 kg N/ha, and a hairy vetch/rye mix was able to reduce weeds (Perkus, 2018). A study in Japan found that spring-planted legume and non-legume cover crops increased soil carbon, an important factor in overall soil health, without reducing tomato yield (Hajime et al., 2009). The major challenge is the reduction in early-spring cash-crop growing time, a loss which may not be feasible for growers who rely on early-spring salad greens or other early-season crops. However, spring-planted cover crops could be a good fit for growers who have one or more unheated tunnels that are not in production in the first few weeks or months of spring. Summer-planted cover crops can be a helpful tool in high tunnels where cash crops are not grown during the summer season because the tunnel environment may be too hot for other crops to grow well, or where a summer cash crop cannot earn a price premium at market. Summer covers may fit well after an overwintered or early-spring crop and before a fall-planted crop. Summer cover crops can be helpful in controlling weed growth during a summer fallow period, breaking up soil crusts, and adding organic matter to the soil. Species used for summer cover crops, especially those planted in early summer, will need to be fast growing and heat tolerant. Buckwheat is a natural choice for a quick-summer cover crop. It puts on biomass quickly, effectively suppressing weeds and supporting soil aggregation (Bjorkman, 2018a). Buckwheat is relatively easy to manage and can be terminated inside a tunnel with minimal mechanized equipment, but needs to be carefully monitored for flowering and seed set so as not to become a weed. For nitrogen fertility, a warm-season legume such as cowpea or sunn hemp (Crotalaria juncea) are good options. Both do well in hot weather and can accumulate noteworthy levels of N and biomass in just 45 days. Sunn hemp may have the added advantage of interrupting the life cycles of some soilborne pathogens and nematodes (Penn State Extension, 2018). If tunnels have the large doors or removable endwalls needed to accommodate larger equipment for termination of high-biomass cover crops, grasses such as sudangrass (Sorghum bicolor (L.) Moenchr), pearl millet (Pennisetum glaucum), or Japanese millet (Echinochloa esculenta) may be good options for biomass accumulation and the addition of large amounts of organic matter to soil. If planting is delayed until mid or late summer, growers may also choose cooler-season legumes or brassicas to seed in the tunnel, similar to planning for overwintering cover crops (Bjorkman, 2018b). Aside from choosing cover crop species that can be reasonably managed with the available equipment, the biggest challenge with summer cover crops is fitting them into available windows between cash crops. Another method for integrating cover crops into high tunnels throughout the season is to plant between cash crops spatially, rather than rotating the crops over time. The strategy of growing two crops simultaneously is called intercropping, and the cover crop is often referred to as a living mulch. Low-growing cover crops can be planted in pathways between the beds. These pathway crops can help reduce compaction, increase soil organic matter, and reduce muddiness in wet areas or when overhead irrigation is used. Pathway crops also reduce the need for weed management between crop beds (Magdoff and VanEs, 2009). After a season of growth, the beds and the pathways can be flipped, tilling in the cover crops and making that area the new beds for cash crops, while planting the previous beds to cover crops to become the pathways for the next season. Low-growing perennial clovers and low-maintenance grasses are best for pathway crops. These species will not shade larger cash crops such as tomatoes and peppers, are shade-tolerant, and are resilient to frequent traffic. Some grass species also have the advantage of quick establishment in the spring (Curran et al., 2006). However, they may need to be mowed to prevent seed set. Though pathway crops provide benefits, there are a few potential challenges. The additional ground cover in the tunnel during cash-crop growth can encourage fungal diseases by retaining moisture, especially on heavy clay soils. The added vegetation also may create habitat for pests, leading to possible cash-crop damage. Additionally, even if maintained by mowing or frequent traffic, pathway crops may spread into cash-crop beds, becoming a weed issue. Figure 6. Red clover seeded in a pathway. Photo credit: Elizabeth Perkus, University of Minnesota. Overwintering Hairy vetch (Vicia villosa) Winter rye (Secale cereale) Most Brassica cover crops are not reliably winter hardy in northern regions. High-tunnel use is increasing in the United States and throughout the world to extend the growing season and improve produce yield and quality. Due to intensive production, the risk of declining soil health is a growing concern in high tunnels. Adding cover crops to high-tunnel rotations can improve soil quality and, in the case of legumes, decrease the need for nitrogen fertilizer inputs. Cover crops are a useful management strategy for sustainable production in high tunnels, but it is difficult to commit time in the growing season to cover crops at the expense of cash crops. 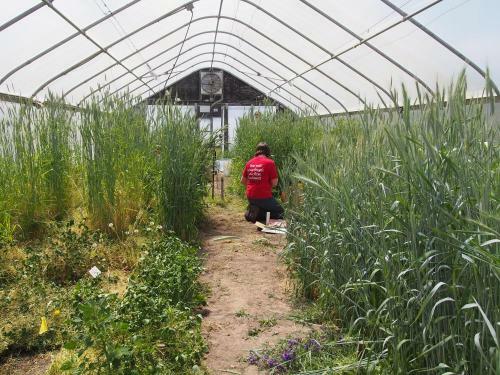 There are many different options for including cover crops in high-tunnel crop rotations in different seasonal windows and as pathways between beds. Growers can choose any of the options that fit into their crop plan either yearly or in a several-year rotation. Management of cover crops is slightly different from the open field, and changes depending on region and seasonal timing, but can be a valuable part of a tunnel production system after some experimentation. Research reported in this publication was supported by the USDA-NRCS Conservation Innovation Grants (CIG) program under award number 69-3A75-14-249, and USDA Sustainable Agriculture Research and Education (SARE) program under award number 2014-38640-22156. Bjorkman, T. 2018a. New York cover crop guide: Early summer [Online]. Horticulture Section, Cornell University. Available at: http://covercrops.cals.cornell.edu/early-summer.php (accessed 2 July 2018). Blomgren, T., T. Frisch, S. Moore. 2007. High tunnels: Using low-cost technology to increase yields, improve quality and extend the season [Online]. Regional Farm and Food Project, University of Vermont Center for Sustainable Agriculture. Available at: https://www.sare.org/content/download/66016/928916/file/HighTunnels_UVM.pdf (verified 5 September 2018). Curran, W. S., D. Lingenfelter, L. Garling, P. Wagoner. 2006. Cover crops for conservation tillage systems [Online]. Penn State Extension. Available at: https://extension.psu.edu/cover-crops-for-conservation-tillage-systems (verified 28 August 2018). Dufour, R., S. Brown, B. Bowell, C. Sendak, M. Vaughan, and E. Mader. 2013. Cover crop (340) in organic systems: Western states implementation guide. National Center for Appropriate Technology. Available online at: https://attra.ncat.org/attra-pub/summaries/summary.php?pub=486 (verified 2 Oct 2018). Dupont, T., C. White, N. Lounsbury, R. Weil, E. Nordell, A. Nordell, N. Shelly, and D. Liker. 2018. 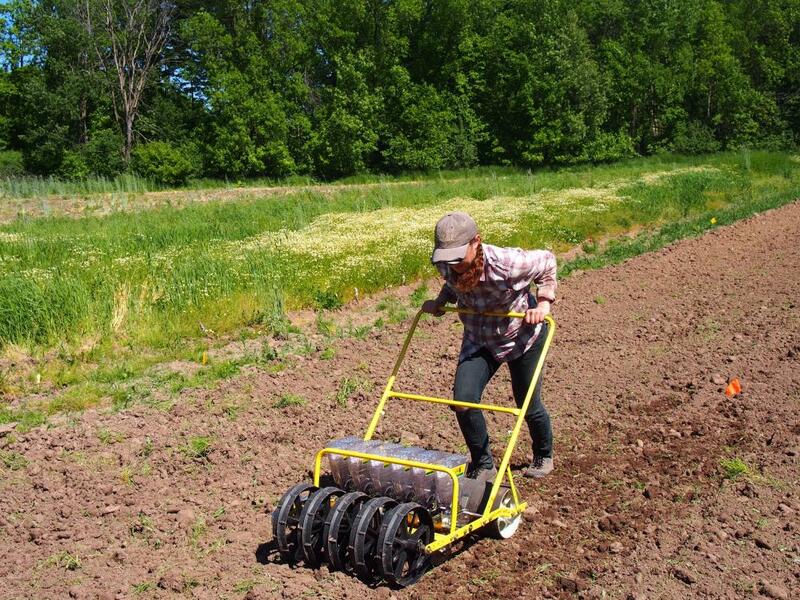 No-till, no herbicide planting of spring vegetables [Online]. Penn State Extension. Available at: https://extension.psu.edu/no-till-no-herbicide-planting-of-spring-vegetables (accessed 2 July 2018). eXtension Foundation. 2013. Solutions to soil problems: high salinity [Online]. eXtension Foundation. Available at: http://articles.extension.org/pages/63502/solutions-to-soil-problems:-high-salinity (verified 2 July 2018). eXtension Foundation. 2016. Manure nutrient management [Online]. eXtension Foundation. Available at: http://articles.extension.org/pages/8647/manure-nutrient-management (verified 2 July 2018). Freeman, L. R. 2016. 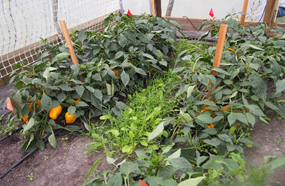 A study of short-season winter cover crops for organic high tunnel production systems. M.S. Thesis. University of Arkansas, Fayetteville, AR. Available online at: https://scholarworks.uark.edu/etd/1823/?utm_source=scholarworks.uark.edu%2Fetd%2F1823&utm_medium=PDF&utm_campaign=PDFCoverPages (verified 2 Oct 2018). Hajime, A., S. Hane, Y. Hoshino, and T. Hirata. 2009. Cover crop use in tomato production in plastic high tunnel. Horticulture, Environment, and Biotechnology 50(4): 324–328. Johnson, G. 2016. Cover crop decisions for vegetable growers part 2 [Online]. University of Delaware Cooperative Extension. Available at: https://extension.udel.edu/weeklycropupdate/?p=9665 (verified 2 July 2018). Magdoff, F., and H. VanEs. 2009. Building soils for better crops: Sustainable soil management, 3rd edition. Sustainable Agriculture Research and Education (SARE) program, Brentwood, MD. Available online at: https://www.sare.org/Learning-Center/Books/Building-Soils-for-Better-Crops-3rd-Edition (verified 2 Oct 2018). Mahr, S. 2016. Powdery mildew [Online]. University of Wisconsin-Extension, Master Gardener Program. Available at: https://wimastergardener.org/article/powdery-mildew/ (verified 8 September 2018). Monfort, W. S., A. S. Csinos, J. Desaeger, K. Seebold, T. M. Webster, and J. C. Diaz-Perez. 2007. Evaluating Brassica species as an alternative control measure for root-knot nematode (M. incognita) in Georgia vegetable plasticulture. Crop Protection 26(9):1359-1368. Abstract available at: https://www.sciencedirect.com/science/article/pii/S026121940600367X?via%3Dihub (verified 2 Oct 2018). Penn State Extension. 2018. Summer cover crops [Online]. Penn State Extension, College of Agricultural Sciences, The Pennsylvania State University. Available at: https://extension.psu.edu/summer-cover-crops (accessed 2 July 2018). Perkus, E. A. 2018. Legume cover crops in high tunnels: Field evaluation for soil health and controlled environment freezing tolerance [Online]. M.S. Thesis. University of Minnesota, St. Paul, MN. Available at: https://conservancy.umn.edu/handle/11299/195376 (verified 2 Oct 2018). Pool, K., and A. Stone. 2014. 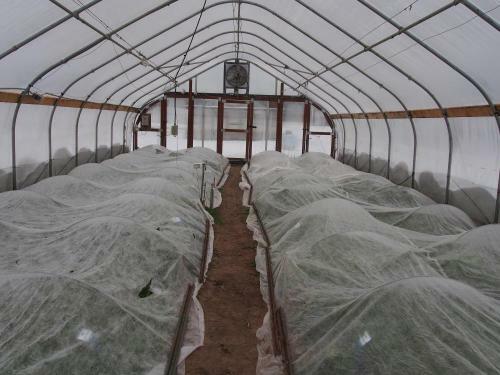 Introduction to high tunnels [Online]. eXtension Foundation, eOrganic Community of Practice. Available at: http://articles.extension.org/pages/18358/introduction-to-high-tunnels (verified 2 July 2018). Pool, K., and A. Stone. 2015. Construction of high Tunnels: resources for organic farmers [Online]. eXtension Foundation, eOrganic Community of Practice. Available at: http://articles.extension.org/pages/18369/construction-of-high-tunnels:-resources-for-organic-farmers (verified 2 July 2018). Rotar, P. P., and R. J. Joy. 1983. 'Tropic Sun' Sunn Hemp, Crotalaria juncea L. Research Extension Series 36 [Online]. University of Hawaii, Honolulu, HI. Available at: http://hdl.handle.net/10125/15089 (verified 2 July 2018). Rudisill, M. A., B. P. Bordelon, R. F. Turco, and L. A. Hoagland. 2015. Sustaining soil quality in intensively managed high tunnel vegetable production systems: a role for green manures and chicken litter. HortScience 50(3): 461–468. Available online at: http://hortsci.ashspublications.org/content/50/3/461.full (verified 2 Oct 2018). Treadwell, D. 2009. Introduction to cover cropping [Online]. eXtension Foundation, eOrganic Community of Practice. Available at: http://articles.extension.org/pages/18637/introduction-to-cover-cropping-in-organic-farming-systems (verified 2 July 2018). USDA-National Resources Conservation Service. 2018. High Tunnel System Initiative [Online]. Available at: https://www.nrcs.usda.gov/wps/portal/nrcs/detailfull/national/programs/?cid=stelprdb1046250 (accessed 2 July 2018). Young-Mathews, A. 2013. Plant guide for crimson clover (Trifolium incarnatum) [Online]. USDA-Natural Resources Conservation Service, Plant Materials Center, Corvallis, OR. Available at https://plants.usda.gov/plantguide/pdf/pg_trin3.pdf (verified 2 July 2018). Zhou, X., and K. Everts. 2007. Effects of host resistance and inoculum density on the suppression of fusarium wilt of watermelon induced by hairy vetch. Plant Disease. 91(1):92-96. Available online at: https://apsjournals.apsnet.org/doi/pdf/10.1094/PD-91-0092 (verified 2 July 2018). Zieminski, A. 2018. Using cover crops in organic systems: resources and research from SARE [Online]. eXtension Foundation, eOrganic Community of Practice. Available at: http://articles.extension.org/pages/67876/using-cover-crops-in-organic-systems:-resources-and-research-from-sare (verified 2 July 2018).